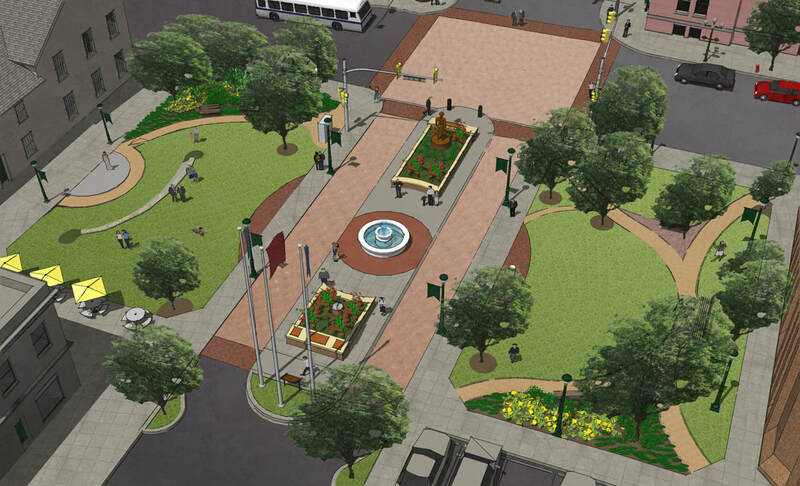 GDA developed five concepts and cost estimates for the redesign of the historic Martinsburg’s town square, founded and established in 1878. The site included the intersection of King and Queen Street and the public spaces on the NE and SE corners. The City chose the "green" scheme which traded parking lots for lawn, perennial beds, fountain, paths and shade trees. GDA specified permeable pavers along East King Street to reduce storm water run-off, widened sidewalks next to buildings for outdoor dining, created performance space for public events, included a cascading fountain, and designed raised planters with a pedestal for the a bronze sculpture of the Town Founder, and a large recessed holder for the Christmas tree.